In fact, it’s already here. And we’re not talking about the weather. This is about something with far more serious economic consequences — a fast-growing need for software developers and tech specialists in general and the resulting, often fierce, competition to retain top talent. According to the U.S. Department of Labor, there will be approximately 1.4 million computer-specialist job openings by the year 2020. American universities are projected to produce enough graduates to fill a mere 30% of these positions. With universities lagging behind, one solution seemed to be to attract more talent from abroad. In 2013, an effort was made by US lawmakers to widen the scope of STEM (science/technology/engineering/math) visas for foreign nationals, but given recent concern about immigration, that solution may very well go by the wayside. Unfortunately, the results could be disastrous, and it’s more than just a simple matter of supply and demand. After all, almost every industry faces manpower shortages and surpluses from time to time. With IT, the effects are more far-reaching. Software and IT technology are everywhere. Any and every change, expansion, even the slightest modification in a business’s function involves some element of information technology. Because the business world moves at such a fast pace, success and failure are often separated by a matter of days, if not hours, when it comes to responding to customers’ needs and taking advantage of the latest trends. This is why having a skilled, highly responsive IT team is essential. Without reliable statistics and the programs to analyze them, a company is blind to the success or failure of their product. The same goes for startups looking to scale their focus to take advantage of a market niche. Without an agile development team, their project is doomed to failure before it ever gets off the ground. A recent survey conducted by research firm Gfk among a range of businesses concentrated within London’s Shoreditch Tech Cluster revealed that 77% saw a lack of skilled workers as the single biggest hindrance to growth. An overwhelming majority (94%) also indicated that they had been forced to turn to temporary workers and freelancers to plug gaps in staff, and nearly half of them found it hard to keep their most-skilled staff. Given this revolving door in the tech labor market, with many employees in IT and engineering prone to leave after only 18 months on the job, it’s no wonder that a large number of projects face serious delays while new members of the team learn the ropes. Global Problem — Global Solutions? This issue can be felt everywhere, and while San Francisco, Seattle, and Austin all rank among the top 10 cities in the world for attracting tech talent, according to a LinkedIn analysis, the gap between supply and demand remains stark. 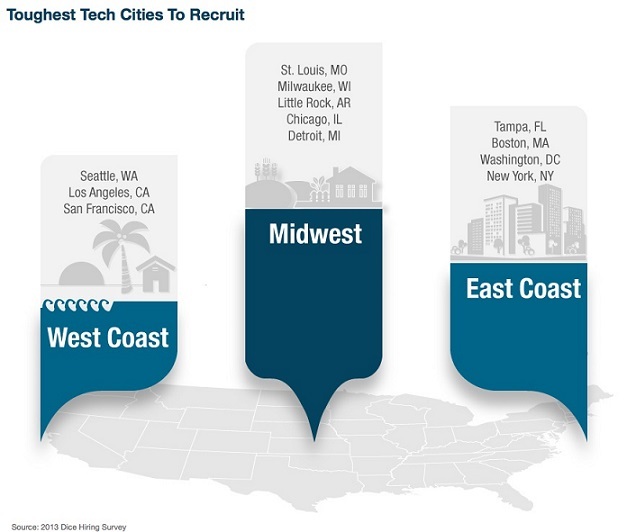 This drought of tech talent will be particularly painful for Midwestern cities caught between Silicon Valley and the Northeast in the race to fill IT job openings. But as a Dice survey indicates, even New York City could face problems maintaining its dynamic, technology-based ecosystem, which grew by 3.5 times between 2006 and 2013. What is also striking is the absence of any major European city in the LinkedIn ranking. Does this mean there is no need for highly-skilled IT specialists in Europe? Hardly. Nor does it indicate a dearth of talent to choose from. Indeed, there is evidence to suggest that Europe, especially up-and-coming Eastern Europe, holds significant numbers of untapped resources when it comes to tech professionals. GFT, a global player in financial services IT, recently took the unusual step of passing out free coffee on the streets of some of Poland’s major cities. The cup of joe was accompanied by an offer of $2,000 for anyone who could recommend an experienced programmer to hire. Andy Tryba, former Strategic Director at Intel and currently CEO of IT outsourcing giant Crossover, also recently turned his eye to Eastern Europe in an attempt to snap up some of Poland’s brightest programmers. Yet he has come up mostly empty-handed. Why? It seems that the brightest and the best have other ideas, like launching their own software startups. Numerous firms have started assembling teams of top talent and begun moving into the US market, shrinking the already-sparse pool of software developers even more. All this begs the question — would it not be better for companies to move away from the in-house IT department model and look to partner with independent software houses? After considering the many upsides of such an approach, businesses are more inclined than ever to say yes. For those with the foresight to deal with the lack of software developers head-on, the positives of teaming up with a software-development company are clear. Not only do software houses have all the right hardware at their fingertips, they also tend to work in large teams with dedicated team leaders and project managers. This means they can pool their experience and knowledge, making them decidedly more effective than outsourcing firms where developers work in isolation without cooperation or project coordination. Working with a development team means applications are planned holistically, taking User Experience (UX) and User Interaction (UI) into careful consideration, but built using the Agile Method, proven to make them less likely to fail. A dedicated tech firm also has the advantage of providing post-release analysis, which is often overlooked in the haste to finish a project. One major advantage of having a large pool of specialists working in a dedicated environment is continuity. No need to worry about a key software developer quitting in the middle of the development process since he or she has numerous colleagues ready to step in and take over almost immediately, helping guarantee a project’s success. Perhaps most importantly, putting things in the hands of a full-service software house means companies are free to focus on the business side of their enterprise. No HR merry-go-round to replace IT specialists and no lengthy delays while replacement developers are found. All of this saves time and money and makes everyone happy.